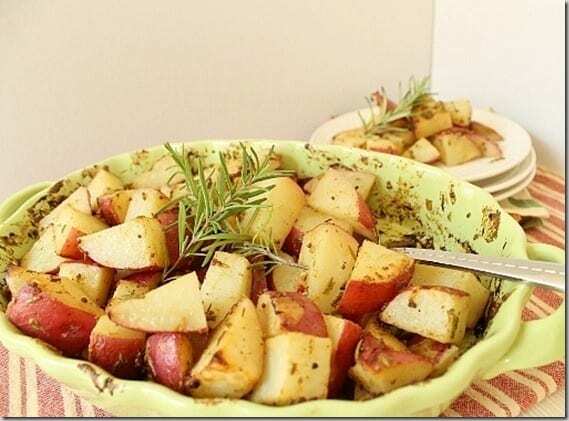 These rosemary dijon roasted potatoes are a delicious savory side. They make a great alternative to the traditional butter roasted potatoes. Add them to your dinner plans! I’m on a bit of a rosemary kick lately. Partly because it’s the only herb that is actually still alive on my front porch, partly because come the cooler weather, rosemary trumps basil as my favorite herb and I start putting it in everything. I understand that people either love or hate it, but I’m a lover. It’s all the smells of the holidays in a cute little green sprig. As the weather gets cooler, I stop wanting quinoa and “healthy” grains alongside my meal and crave warm hearty dishes instead. Is there anything more comforting and warm than roasted potatoes? Usually, roasted potatoes in my family means a hefty amount of butter to coat and crisp them up. Now, there’s nothing wrong with some butter but if I’m going to eat potatoes for the next 6 months while in hibernation over here, I want to at least attempt to make them waistline friendly. Mustard and rosemary are the perfect combination for that while still keeping your taste buds intrigued. These things are like Lays, you can’t eat just one. Not that you’d want to anyway. Grease a 9X9 or similar baking dish. Wash and cut potatoes into 1 inch cubes. Transfer to a bowl and toss with rosemary, mustards, olive oil, lemon and lots of salt & pepper to taste. Transfer to baking dish and bake for about 1 hour, tossing a few times. What food do you find comforting in the colder months? I love the addition of honey mustard! Its one of my favorite condiments. I think my favorite condiments are basil and garlic powder. And maybe dill. yum! I had comforting potatoes last night – cheese n’ broccoli twice-baked potatoes actually, and they were wonderful! These look amazing. I am seriously a sucker for a good batch of roasted potatoes! I usually just do oil, rosemary and pepper in a bag and shake ’em up. I like the idea of the mustard. Must try! Where was this post last night when I made us chicken and couldn’t figure out what to make to go with it? :) It looks delicious! 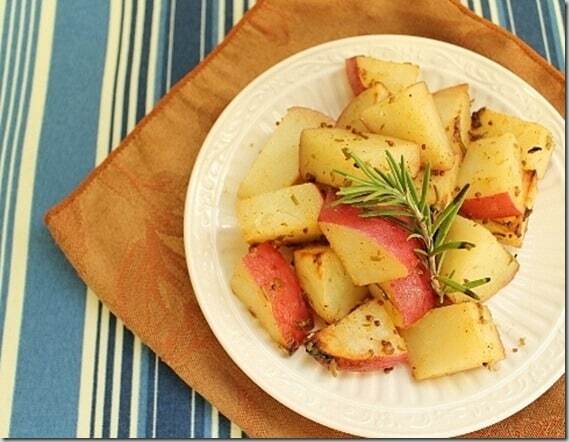 NOTHING pairs better with rosemary than roasted potatoes!!! Love this dish! Soups are definitely my number one! Anything warm usually does the trick but there is something incredible about soups/stews/chilis that can do magical things to a cold body! this is like a winter potato salad. Dear lord I love you. I love soups and casseroles during the cold months, I try to avoid the oven as much as I can during the summer. And I need to try these roasted potatoes, they look amazing :) Thank you! OMG! You are so right about the basil/summer, rosemary/winterish correlation. I have nto put rosemary in a single dish this summer. And I love it. 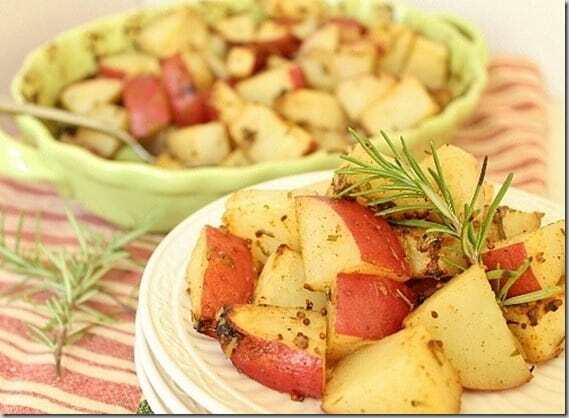 I make the potatoes with thyme, dill and rosemary, salt, pepper and oil in the oven. 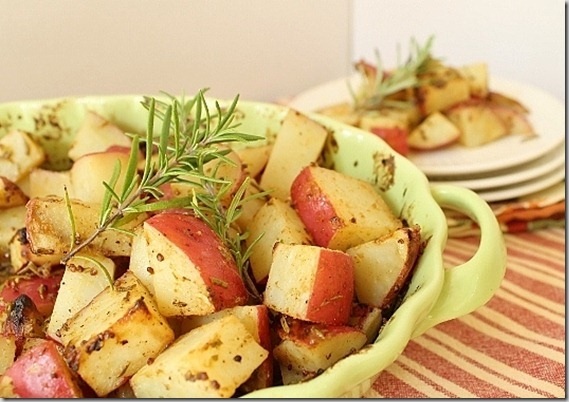 there is something about rosemary and taters that just GOES so well together…and dijon, nice. I am a bigtime mustard lover! Oooh, I love rosemary! And potatoes. So this recipe is a win-win for me! :) I find any dishes that are served comforting in the cold weather – especially soups and warm pasta dishes. As for herbs, there aren’t many herbs I don’t like! My current fave might have to sage. One of my favorite local cafes serves rosemary potatoes with their breakfast, rather than hash-browns, that I absolutely adore. Why I’ve never thought to make them at home? I couldn’t tell you. But, I will be now! Thanks for sharing the recipe! Cilantro, basil, rosemary, dill, parsley…I really want to be BFFs with Thyme, but we’re not there yet.